Aroused! A meet. A moment of presence. Aroused! is a 3D interactive installation for one person at a time. From the tension field between video, animation, installation and computer game occurs this 3 minute long meet between a (virtual) mythological character and the spectator. 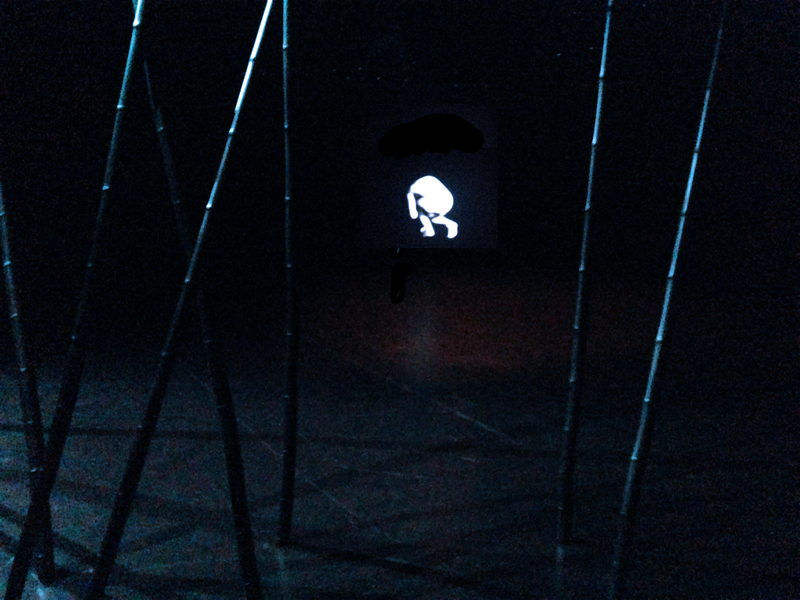 The piece begins already when a person enters the space which is staged as a performance space: stars on a dark sky, a forest of black logs, a slightly illuminated glade with a (3d projected) naked kneeling person. When the spectator moves closer the virtual person rises and the meeting unfolds through intimidating video- and soundscape. The piece is interactive in a way that let the spectator launch a row of occurrences; If the spectator is present and curious and plays with the responding computer system behind the piece he/she will notice that her or his behavior influences the meeting. The visual appearance is reflecting the spectators presence and attention. At the end the piece takes over – the character points his attention somewhere else and the piece leaves the spectator and not the opposite as normal.